Mount Washington is not very accessible to the cyclist. Only once or maybe twice a year can a cyclist legally ride their bike up the mountain, and then only after plunking down hundreds of dollars. If you are a serious hill climber, itâ€™s tough to know if you have your gearing right, or the status of your fitness level before the big day. This is where Mt. Ascutney in Vermont fits in nicely. For a few bucks, you can ride your bike up and down as many times as you want in a day, any time during summer. It has the same average grade as Washington, but rises half the vertical. The state park also runs their own annual hillclimb race in July so you can be timed in a competitive environment. Many riders have often wondered how their time on Ascutney translates to a potential time on Washington. This question has been answered from time to time on the Hillclimb Forum in various ways. I decided to take a little more rigorous look at this using a good data set. In, 2002, 70 riders competed in both Ascutney and Washington hillclimb events, myself included. The weather for both events was similar (very nice), making this data set a good apples to apples comparison. The 70 common riders were nicely distributed over the range of finishing times. Since posting the Ascutney charts a couple years ago, many riders have commented that the multiplier presented below very closely predicts their Washington climb time. Mount Washington is also compared with the other popular northeast hillclimbs here. The charts below give a statistical analysis between Washington and Whiteface, Ascutney, Equinox, Wachusett, and Greylock. There are a limited numbers of riders completing both Washington and compared climb in the same year for a couple of the climbs. Also, the first running of an Equinox climb in a long time took place in 2004. The weather was excellent on equinox, but lousy the same year on Washington. Thus this comparison will be a bit skewed until a better data set becomes available. A similar thing holds for Greylock, as 2004 was the first year that hillclimb was a USCF sanctioned event, drawing over 100 riders. Weather was nice on Greylock, crappy on Washington. Many riders felt 2004 Washington weather took at least 2-4 minutes off their potential good weather time. So hereâ€™s how the charts work. I scanned each climb for riders that also completed Mt Washington the same year. The compared climb, say Ascutney, would go in one Excel spreadsheet column, while that same personâ€™s Washington time would go in the adjacent column. The columns were sorted in ascending order of compared climb, Ascutney for example, with the respective Washington time in the adjacent column. In the charts below, the first chart of each comparison gives the Washington and compared climb for each rider sample. 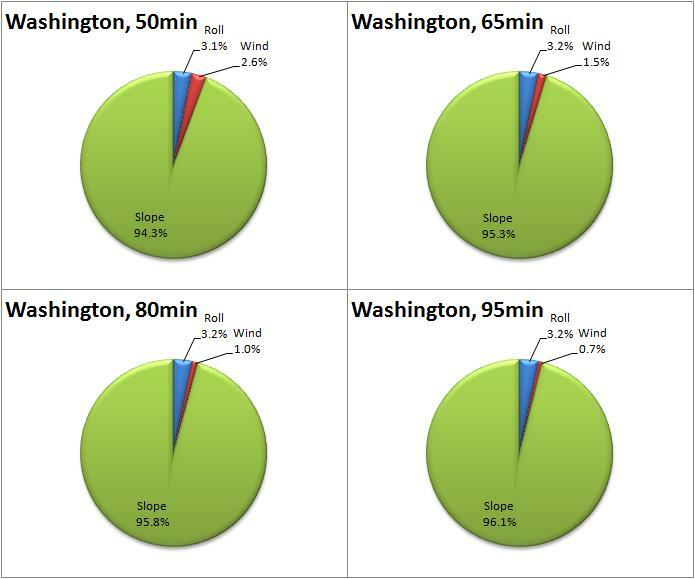 Then in Excel, I divide each Washington time by the compared mountain time. This gives a ratio, plotted in the second chart. The mean (average) of this ratio is what most people can use to predict their Washington time. Since Washington takes longer to climb than any of the five compared climbs, this ratio is always greater than one. Excel then computes a linear trend through the pool of rider samples. This can be slightly more accurate than using a simple mean for the really fast or very slow riders. But it requires punching more buttons on the calculator for only slightly improved prediction. 1) Climate. Say you climb Ascutney in July on a perfect, windless, 70 degree day. You do well and predict youâ€™ll break top notch on Washington. Come race day, you find itâ€™s 35 at the summit, 50 mph winds, and raining. The extra layers, wind, and mud will all slow you down. You get the idea. 2) Physiology. Not tapering the same for both events, diet, rest, and temperature can all affect physiological performance. 3) Gearing. Differences in grade might not be fully accommodated for. Ascutney, Equinox, and Washington are steep. Not gearing low enough can cause a loss in efficiency. 4) Conditioning. Many cyclists periodize their training, so an early season Whiteface climb would not be indicative of later season Washington performance. 5) Sample size. A small number of cyclists compete in each of the climbs compared to Washington. â€ There were 14 common riders, but one rider was omitted from data set due to suspected technical difficulties on Washington. * Climbing times from July and August 2002 were used to obtain large enough sample set. A very interesting aspect jumps out of this analysis. Climbs that take place early in season have a negative slope correlation with mid season Mt Washington. Climbs that take place in the same month or after Mt Washington have nearly the same or positive slope correlation. One astute climber gave a very plausible explanation for the negative slope correlation. Many hillclimb competitors begin their training in earnest when the weather warms. They have their sights set on Mt Washington, and hope to peak in performance in late August. The Ascutney climb takes place a few weeks earlier in July. So the theory is, the slower riders are still ramping up in performance when hitting Ascutney, while the faster all-year riders are already near their peak. These slower seasonal riders then increase performance further before hitting Washington. Their slow Ascutney time would thus misrepresent their Washington time. All year riders, like myself, maintain a more constant level of fitness. There may be enough people in these two camps (peaky seasonal riders, steady all-year riders) to produce this negative slope correlation. Itâ€™s hard to say why the slope turns upward when comparing other climbs right around the Mt Washington time. The sample sizes are much smaller for these comparisons, and the riders compared in each case are not common among all six hillclimbs. A different subset of riders from each mountain is compared with Washington. There could be a gremlin in this. It would be desirable to have the same group of 50 or more riders compete in all six events. Nonetheless, most of the riders compared fall around the average finishing time, thus the mean of the ratios should be fairly accurate. It appears the tails of the distribution (really fast or very slow riders) is driving the correlation slope. The positive slope for Greylock vs Washington would suggest either the fastest riders gain late season performance or the slowest riders lost late season performance. Exactly the opposite of this is suggested when looking at an early season Whiteface to Washington comparison. The fastest riders in June are relatively slower on Washington in August, while the slowest riders in June are relatively faster in August. So in my case, itâ€™s off by almost 2 minutes. As a side note, the standard deviation of the error is about 4.8 minutes. So many riders will expect to see an error of a few minutes either way of the estimate. So now the error is 1:45 minutes, slightly better. There is one other important way these findings can be used, as David from Maine pointed out. What if you wanted to find out how fast you had to be on one of these climbs to make Top Notch (1:20) on Washington? You can do this, within statistical margin. I show this in the table below. The time to break Top Notch on Mt Washington is computed to zero and one standard deviation, so if you can break this time listed on any of these mountains, you have about a 50% or 84% chance respectively of making Top Notch on Washington. Of course, all of the limitations given above the charts apply here. Several loose assumptions are used here too, such as Gaussian distributed data. So this table says if you climb Whiteface in 59.1 minutes, you have a 50% chance of doing Washington in less than 1:20. If you donâ€™t like this kind of odds, try for 54.5 minutes on Whiteface. Youâ€™ll have an 84% chance of finishing Washington in 1:20. The two charts below help explain this. 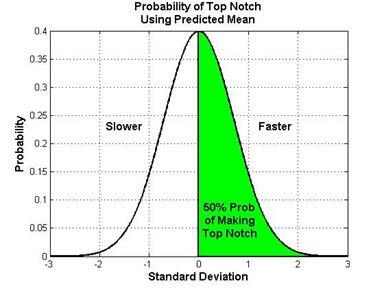 If you finish right at the time that statistically puts you right at the top notch threshold (1:20), you have a 50% chance of not making top notch (unshaded side), and a 50% chance of making top notch (green shaded side). So if you want more margin than this, you need to be faster than equivalent top notch time on the other mountains. 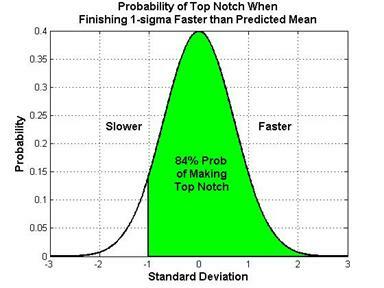 If you are 1-sigma faster, thereâ€™s only a 16% chance youâ€™ll be slower than top notch on Mt Washington, and 84% chance you make top notch. This is shown in the second chart below. Many assumptions and simplifications went into this terse statistical analysis, so it is intended more to give you a qualitative feel how the climbs relate to one another. What is captured here are natural variances of a given rider from climb to climb. Training. state of recovery, diet, rest, all cause variances in a riderâ€™s time to climb a given hill. I tried to exclude climatic variances from this analysis. We all have good and bad days. If we didnâ€™t, you could predict with much greater accuracy how we will do on any given climb. Some day when I learn Java or another suitable scripting language, Iâ€™ll build an online calculator. This way youâ€™d just have to enter a time for one of the climbs, and it will return estimated times for the other climbs. Eric Brandhorst did an excellent analysis of Mt Washington hillclimb race rider age distribution and correlation of climbing time with age. Note that the analysis is not a controlled study. Only those who finished the race in the years 2002-2004 are tallied. Mt Washington climbers likely do not represent the general cycling population. Many elite younger racers do not participate. I would assume many recreational riders also avoid Mt Washington. Further, as Eric shows and Iâ€™ve also known for some time, the 40-45 year old age group always tends to be the biggest. Is this true of the general cycling population? I donâ€™t know. I speculate that a lot of 40-something year old males fear they are going over the hill so they climb a great big hill to prove they arenâ€™t over the hill yet. Anyway, Ericâ€™s analysis is summarized with two charts here. The first shows how many riders at each age completed the race over the last three years combined. Also shown in red is the average of finishing times for each age. The second chart shows a linear regression of finishing time with age. The interesting tidbit to take away from this second chart is the slope of the linear trend. Excel computes the trend to be 5.18e-04 days/year, which is about 45 seconds per year. This means that when looking at all Mt Washington riders, we get slower by 45 seconds per year. One of the top finishers on Mt Washington recently quipped to me something like â€œanother year, another minute slower.â€� Not far off from what Eric shows here. If we go back to the first chart, we actually see more than a simple linear trend (linear simply means a straight increasing slope like the thick red line above). The trend is much more complicated, and you can possibly read a few things into it. First off, very young riders are not yet physiologically developed, so they will be slow. A linear trend would suggest infants to be the fastest, but common sense says this cannot be so. So riders start out slow in youth, but not too slow. Then thereâ€™s a precipitous drop in climbing time. Presumably this is where many of the elite riders fall who come out to the mountain. Males reach their prime ability in their mid to late 20â€™s. But looking at riders in their 30â€™s and early 40â€™s, the curve nearly flattens out. Here what I think is going on is as riders age, they become more health conscious, more disciplined in diet and training, and are able to maintain fitness despite approaching middle age. But eventually nature wins, and no amount of proper diet and training will keep us fast. Around age 50, an aggressive slowdown kicks in as noted by the abrupt increase in slope. I know many elite senior and masters riders that do not come out to Mt Washington. If these riders were more proportionately represented in the sample set, I would expect a much broader dip in the 25-40 year old age groups. Then, if a trend were plotted from say 25 to 80, youâ€™d see a much more aggressive slowdown with age, probably over a minute per year. The flatness of the data from 30 to 50 years of age doesnâ€™t mesh well with personal experience of riding with people spread out over these ages. Most competitive 30-35 year olds I know are much faster than most 40-something year old riders I know. When I look at the second chart, there is another thing I notice which tends to suggest everything just stated in the previous paragraph is bunk. A reasonable assumption to make is that over the last three years, Mt Washington has seen some pretty good representative samples from each age group. By this, I mean riders that are at the peak of what can be achieved at their age have shown up on Mt Washington. If this assumption is true, faster riders in each age bracket (or at least over a few 1 year age brackets) cannot be found. In the chart above, Tom Danielson is represented, who broke Tyler Hamiltonâ€™s record. There are undoubtedly other top of their age class riders represented out to nearly 60 years of age. If you drew a line across these â€œfast as can be at ageâ€� riders as I have done with the thin black line above, you will note that the slope is the same as the general trend. Thus over a range of about 24 to 58, the 45 seconds pre year estimate holds up well for the most fit athletes also, all who easily are in the â€œTop Notchâ€� category. If you use Tomâ€™s 49 minute finish at age 24 as a baseline, 45 seconds per year is about 1.5% slower per year, 15% in 10 years, 30% in 20 years, and so on. Thus in thirty years Tom will still be able to fly up the Rock Pile in about 70 minutes. But I bet somebody like Tom can break the statistic given here! Anyway, many thanks to Eric for gathering all this data and providing an informative analysis. One of the most important numbers in the table above is the total energy. About 1.3 MegaJoules were consumed climbing. This is approximately 1300 food calories. The yellow power curve below is fairly â€œnoisyâ€� due primarily to alternating between seated and unseated pedaling. Out of the saddle hammering tends to produce more power. The red heart rate line runs fairly steady, a desirable time-trial trait. On the steeper parts of the climb, average power was maintained, which kept HR constant. Staying in the same gear and going harder would risk â€œblowing-upâ€� before the top. I try to ride hillclimbs at critical power, which is the maximum steady power you can just barely hold all the way up. If you had to go a few meters further, you would not be able to hold the power any longer. It is very hard to do this and takes much training and practice. Note that right at the end, my HR climbed. This was on the 22% grade at the finish line. Had just enough left to sprint it, knowing I could stop and recover (or throw up) in just a few seconds. One final observation. As the climb progress, power output drops. Near the beginning of the climb, power produced was around 340 Watts. However, near the end of the climb less than 300 Watts was being produced. Heartrate dropped very little during the climb. It is generally known that optimum time trial performance is achieved with constant power output. Thus if a climber uses heartrate as feedback, the heartrate should rise during the effort in order to maintain constant power. Easier said than done though. 1. Gross weight before and after climb was 191.8 lbs and 189.8 lbs, 2277ft vertical from TopoZone.com. 2.0 lbs water was lost through sweat. 2. Estimated average climbing weight is 198 lbs, using 2130ft vertical from TopoZone.com, noticeable headwind on climb. Rain soaked, full Camelbak. Note that losses average 7.6% for the first eight, but are considerably higher for Mont Vernon. The Mont Vernon climb is short, only 6% average grade, and flattens out at the top where speed goes up and loss becomes predominantly wind resistance. Another thing to note is that when losses are only a few percent, being off just a few pounds on estimated total climbing weight translates directly in percent loss being off a couple percent. It is hard to estimate water loss to within a pound when you get to the climb, plus on a long climb like Washington you can easily lose a couple pounds of fluids during the climb. Further, no two mapping tools I have give the same elevation gain for any of these climbs. If I use DeLorme Topo 4.0 for Pack Monadnock, the percent loss is 10.2% since this mapping software suggests only 770 feet gain. 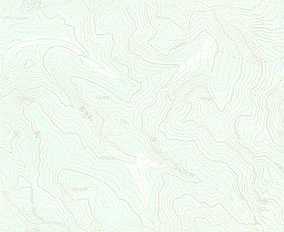 TopoZone.com gives 800 feet from USGS survey maps, which I used. The state park map says 840 foot gain, and this would suggest a loss of only 1%, which is highly improbably. All of these, potential air resistance, uncertainty in weight, and uncertainty in climbing gain make it pretty difficult to compute losses. Another interesting pattern is beginning to emerge from the data. Looking at the Whiteface data from the 2005 hillclimb, three riders of increasing weight submitted PowerTap data. The rider with the lowest weight had the lowest percent loss, while the heaviest rider had the highest percent loss. I would expect the percent loss to be fairly constant over a range of weights. Rolling resistance is generally a constant ratio. Wind losses would have been very low on this calm, humid evening. The riders did estimate their total climbing weight, so maybe rider C underestimated. My weight falls in between riders B and C, and my losses on other climbs ranges 7-8%, in line with a rising loss rate with weight trend. I hope to collect data on many more climbs and riders to build a broader statistical basis for any conclusions. Using the PowerTap system, power output vs. heartrate has been studied. The data for this study was collected during the fall of 2003. Average power, cadence, and heartrate from over 40 rides or intervals during rides was collected on plotted. Only rides or intervals where an fairly steady paces was maintain were used. Note that these results that are presented are highly individual. These results can also change dramatically for an athlete from season to season as will be shown. The first plot below shows power output and cadence versus heartrate. The blue diamonds are average power for a ride or a specific interval from a ride. The green triangles are average cadence from the same efforts. Also included are yellow dots from a power vs. heartrate sweep that was performed at the Human Performance Lab, Elliot Hospital in Manchester, NH in November 2001. All three data sets have trend lines drawn through them, linear in the power vs. heartrate cases, and parabolic in the cadence vs. power case. Take the blue curve above first, data from the fall of 2003. It is well known that for aerobic efforts, power output linearly tracks heartrate. In my case, I produce another 2.9 Watts for each beat per minute increase in heartrate. This trend can break as the anaerobic threshold is reached, in my case, somewhere around 300 Watts. Most of the data collected was for easy recovery or moderate endurance pace rides. Data is rather sparse for hard efforts, which mostly came for short (5 to 70 minutes) hillclimbs. But each data point does seem to fall on a straight line, a linear trend. Now consider the yellow curve, data from November 2001. The data was collected on an ergometer in a very well controlled clinical environment by professionals. Power was increased every 6 minutes and heartrate (and lactic acid) were allowed to stabilize. Thus the data measurements very closely follow the theoretical linear trend. In 2001, I set personal bests on Mt Ascutney and Mt Washington hillclimbs, which have not been beat (yet). So I was fit. But the 2001 and 2003 power vs. heartrate curves have a huge offset at lower heartrates. This was unexpected, but explains many things I have been experiencing lately. Take 120 beats per minute for example. In 2001, I produced about 115 Watts. In 2003, I produce about 185 Watts, a 61% increase!! In 2001, 120bpm was well inside my recovery zone and felt very easy. In 2003, 120bpm didnâ€™t feel so easy, and I didnâ€™t understand why. My riding partners would say things like â€œI thought we were going easy today,â€� and I would say â€œIâ€™m only doing 120!â€� To look at this another way, take 150 Watts, which would have been about the threshold of recovery zone in 2001, at 130bpm. But in 2003, I would have to ride at about 108bpm to stay at the same power output, about a 17% drop in heartrate!! Now as best I can tell, my max heartrate has not changed over this two year period. It is still around 185bpm. My resting rate hasnâ€™t changed either, at around 36bpm. But whatâ€™s in between has changed dramatically, and without power measurement, I would never have known exactly what was going on. I suspect the physiological basis of this change is that my heart pumps much more blood per beat at low to moderate exercise levels in 2003 than it did in 2001. For 2004, I will fully transition over to training in power zones rather than heartrate zones. To do this, critical powers will need to be established. These are the power levels that can be constantly held for no more than say 12 minutes, or 60 minutes, etc, called CP12 or CP60. Training is then based on seconds or minutes in the short, high intensity zones, or hours in the low intensity zones. Recovery effort is generally a level less than 1/2 of CP12. I estimate my CP12 to be around 340 Watts. Thus a recovery ride should not exceed 170 Watts, which from the blue line above would be at a heartrate of no more than 113 bpm. The 70% of max I previously used gave a recovery heartrate of 130bpm, which for my present conditioning is way too high. Cadence vs. heartrate for the same PowerTap data set is plotted in green above. I wanted to see if there was any correlation between cadence and heartrate, to see if cadence was really constant and independent of effort as I believed. It is not. Clearly, cadence is dependent on effort. The moderate efforts have the highest cadence, peaking around 95rpm. Then cadence drops for both easy and hard efforts, to around 85rpm on both ends of the effort curve. The drop in cadence at the hard end is easy to explain. Most of these data points were for hillclimbs, where sometimes an easier gear just isnâ€™t available, or I alternate between seated spinning and standing mashing. I usually shift up two gears when coming out of the saddle in climbs, but not picking up speed much. Thus cadence drops during standing climbing. The drop in cadence at the easy end of the curve is not as easy to explain. I suspect that the tension in muscles is so low that a harder gear is selected to keep at least a little tension for feedback in the legs. I have not been able to find any cadence vs. heartrate (or power) curves for comparison. An example. At 130bpm, I produce 213 Watts. Say I ride 1 hr at 130bpm. This gives average power for the ride of 213 Watts, which is 213 W * 3600 sec = 767 kJ. Divide this by 4186 J/cal, we get 183 calories of output energy. But humans are not very efficient at converting food calories into work calories, so we divide this by worst case 0.20 to get 916 calories of burned energy. Thus I could be burning as many as 916 calories per hour at a 130bpm heartrate. I suspect Iâ€™m closer to 25% efficient based on extensive conditioning, so Iâ€™m probably burning more like 733 calories per hour. This is close to the 767 kJ of energy I produced. A loose rule of thumb is to equate kilojoules of energy produced to calories burned. This will get most people in the ballpark. Riders often comment about â€œdraftingâ€� or â€œworking with someoneâ€� on a hillclimb. For typical riders on steep New England climbs, attempting to stay on another riderâ€™s wheel will often result in your demise. Using a graphical approach, I will attempt to show why. A typical rider will be used in this analysis. He or she weighs 160 pounds (72.5kg), rides a 20 pound (9.1kg) bike, has a frontal area of CdA = 0.5m^2 (high side estimate), rides wheels with a rolling resistance Crr = 0.004. These values were used in fairly robust calculators at Analytic Cycling. Weâ€™ve all heard that riding in a pack can reduce energy expenditure by up to 40%. That may be for elite riders in the center of a fast moving peloton. The savings are much more modest drafting a single other rider, maybe 25% at best closely following one other rider a high speeds. 25% is still significant, however. The figure below helps explain this. A vast majority of output power is used to overcome wind resistance for this rider in non-aero gear. Only 12.5% is rolling resistance. In this case, power goes up as a cubic function of velocity. To get wind and rolling resistance to equal one another in this example, the rider would have to go about 10 mph. But keep in mind, rolling resistance of road tires is very small. Power does not start to go up appreciably until speeds reach 20mph or going uphill. Only 29W is needed to roll at 10mph, but at 27mph, 308W is needed. So what happens when we throw gravity into the mix? A couple of popular climbs here in the northeast are Whiteface Mountain in New York and Mount Washington in New Hampshire. These are good climbs to use for analysis here, because they are pretty consistent grades the whole way up. Whiteface averages 8% for 8 miles, while Washington averages 12% for 7.6 miles. Obviously, riders will climb Whiteface faster than Washington. It is slightly more distance than Washington, but Washington is 50% steeper. Thus aerodynamic effects may have different impacts on these two climbs. Letâ€™s start with Mount Washington. The record finishing time was set by Tom Danielson in 2002 at just under 50 minutes. If our typical 160 lb rider where able to finish the climb in 50 minutes, his power would be distributed as shown in the upper left pie chart. 94.3% of his energy expenditure would be used to overcome gravity on the 12% grade. Wind resistance is a tiny 2.6% at the 9.1mph speed a 50 minute finish would require. If this rider had a clone to work with him on the climb, heâ€™d at best save 25% of the wind resistance, or 25% * 2.6% = 0.65%, or less than 1% of total energy expenditure. Data does not exist for drafting benefit at such low speeds. It is likely less than 25%, resulting in a tiny fraction of a percent energy savings. This would be for a world class elite rider. As you go down to the lower right corner of this quad of pie charts, we see a fairly typical finishing time of 95 minutes. This equates to about a 4.8mph average speed. Here power to overcome wind resistance has dropped to 0.7%. Remember, drafting can only produce savings in wind losses. It does not make the slope less steep, it does not make your expensive tubulars roll with less resistance. At this brisk walking speed pace, there surely is no draft created by the rider in front of you. If a rider came by you at 5.3mph and your speed was 4.8mph, you then thought to yourself â€œI should hop on.â€� Donâ€™t do it! You are going to save a negligible portion of 0.7% of your power (that is none), yet your power will go up 10% by hopping on. Boosting power by 10% without saving any kilojoules in the process will result in swift, thorough meltdown. The passing rider will push you well past your threshold level even though she was going only half a mile per hour faster than you. Itâ€™s the gradient that makes things work this way. Now letâ€™s look at Whiteface. The record on Whiteface is about 42 minutes, set by Dan Cassidy in 2007. Whiteface is much less steep than Washington. In the upper left pie chart, we see that wind resistance starts to become a bigger percentage of total energy expenditure for an elite rider. At 45 minutes, average speed would be 10.7mph, and 4.9% of the power expended goes against aerodynamic drag. This is still pretty small, however. Does it make sense for an elite rider to draft here? Maybe. Say two similarly fit elite riders are shadowing each other up this climb. Further assume you could realize a 25% reduction in wind resistance by drafting at such a slow speed (not likely). 25% of 4.9% is about 1.2%. If the weaker rider was within 1.2% of the fitness of the stronger rider, it would pay for him to draft the stronger rider. If the difference were greater than 1.2%, eventually the weaker rider will blow up trying to hold the stronger wheel and will likely lose more time against the clock after this happens than if he just held his own ideal time trial pace. So you can see, even on a not so steep grade, elite riders have to be very closely matched in fitness in order to work together or derive draft benefit. 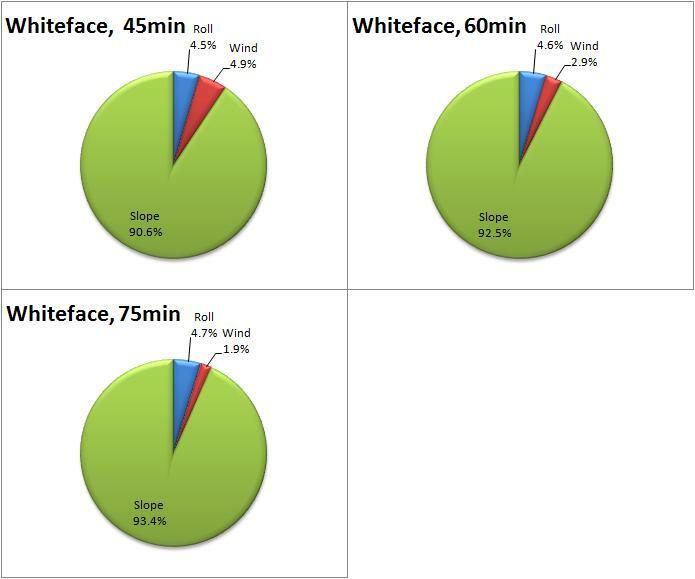 A typical time on Whiteface may be more around 75 minutes. Here wind resistance is only 1.9%. At the slower speed here, drafting benefit again is completely negligible, unless the riders are virtually identically matched in ability. This is highly unlikely. Even if a rider had a clone to help him by cooperatively drafting, maybe a quarter percent of total energy expenditure is saved (each share half the work, 25% wind resistance reduction of 1.9%). This saves what, 11 seconds? Not worth even risking. It is best to practice, practice, practice on finding your best pace for a given climb. â€œWorkingâ€� with another rider will result in driving your pace too high or slowing you down because the other rider is slightly less fit than you. There may be a couple special circumstances where drafting provides a net benefit. These are strong head winds or psychological benefits. 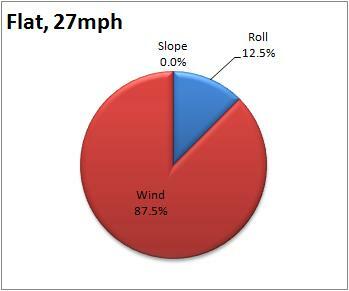 A strong head wind can drive up the wind loss portion of the pie chart. This effectively opens up the possibility space of drafting another rider. What I mean by this is that as the head wind becomes stronger, the less fit a drafting rider needs to be to hold and derive benefit from a wheel in front of him. 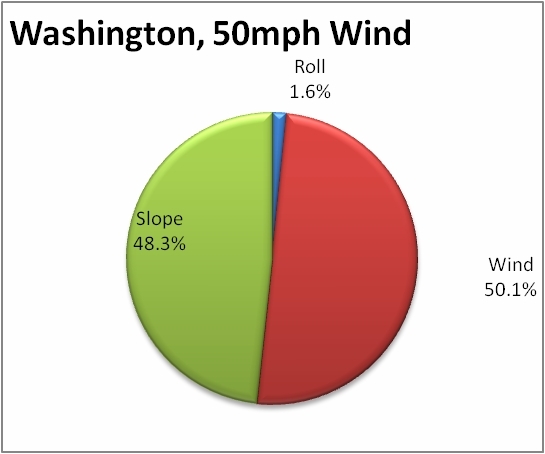 Chances are good to encounter 50mph wind on Mt Washington. This increases wind loss many fold, making wind resistance on par with gravity resistance as shown in the chart below. It also increases the effectiveness of drafting, meaning a more well defined slipstream is created behind a rider pushing into a strong head wind. It may be possible to realize a 25% savings in wind resistance in this scenario, leading me to believe a weaker rider may be able to draft a rider up to 12% stronger on 12% grade (25% savings of 50% wind resistance = 12.5%). The psychological advantages are much harder to quantify. This has many aspects to it. For some, it is the competitive challenge nature to interacting with another rider, forcing one to dig deeper than if they were riding in isolation. For others, it may be the â€œmisery loves companyâ€� factor. If you are really hurting, chances are others around you are really hurting too. Cyclists are notorious for taking pride in making others suffer by holding a pace that others struggle to hold. It may be the case you have trouble pacing yourself. Riding with or near other similarly fit riders that are more consistent pacers may give you some benefit by letting you hold a steadier pace. Thereâ€™s a term called social facilitation in the exercise physiology world. It was proven more than a century ago that athletes perform better when their performance is being observed by other humans. These can be spectators or other athletes they are competing against. Riders close to you on a hillclimb are probably direct threats, and interacting with them may give you that psychological boost you need to squeeze just a few more seconds off your time. Youâ€™ve probably heard of motorpacing as a training method. This actually touches on all these reasons. The psychological advantages are myriad and very difficult to prove in any kind of quantitative study.